Bring spring into your account this March by welcoming the season with a 77% Bonus + 77 Enchanted Spins! Spring will certainly be in full bloom when you hit the spin button of Enchanted Garden! Fairies, Unicorns and the Fountain of Youth are all part of the scenery in this spring-themed slot. The Wild Fairies appear on the second, third, fourth and fifth reels and also double any prize value when they appear. Free spins occur in combination with the Fairies and the scatter Unicorn! 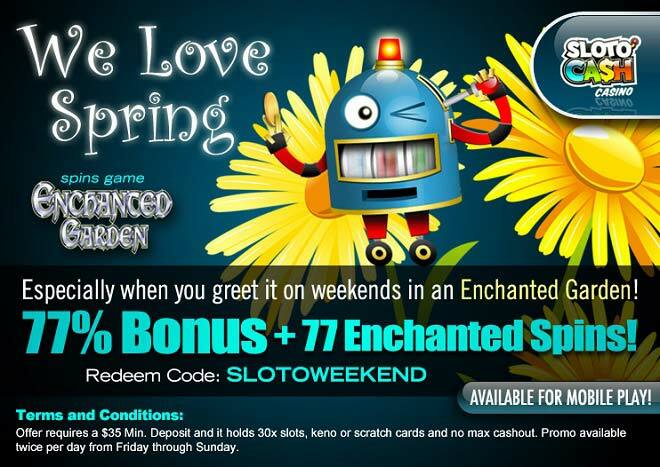 Brighten up your spring weekends this March when you deposit as little as $35 to play with a 77% Match plus 77 Free Enchanted Spins!